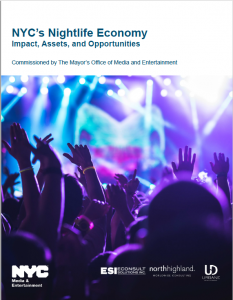 New York City's Nightlife Economy | Econsult Solutions, Inc.
Econsult Solutions, Inc. (ESI) in partnership with North Highland and Urbane Development, completed the first ever economic impact study on the City of New York’s nightlife economy. Direct impact of New York City’s nightlife economy and historic trends across subsectors and geographies. Total economic impact of New York City’s nightlife economy, including indirect, induced, and ancillary spending as well as fiscal impact. Case studies of the nightlife economy within each New York City Borough. Specialized geospatial analyses of establishment distribution and historic taxi/Uber/Lyft trip demand during key nightlife hours. The team developed a direct spending model by identifying the establishment categories that fell within the parameters of a nightlife establishment, using Bureau of Labor Statistics data to aggregate jobs and wages data and US Census Economic Census data to calculate output of these establishments. Additional market research and primary data collection was performed through surveys to identify consumer trends, to understand challenges and opportunities facing nightlife operators and professionals, and to develop policy recommendations for New York City. The analysis resulted in an estimate of the total direct economic impact of nightlife in New York City, and allowed us to identify trends by geography and subsector within the industry.